Summer is so close now! At least for those of us in the Northern Hemisphere. And summer – to me – means vacations, road trips, ice cream, beaches (even though it’s been years since I’ve gone to one!). It also means I can wear my flip flops, which I love. Because, you see, in RL I hate shoes. HATE them. Socks, too. But I love how they look… just not how they feel. So I’m happy to indulge my would-be shoe obsession in SL instead. When I put together this outfit, I knew it needed some strappy sandals, and I found the perfect pair at Glamistry… along with some fun, flirty, vintage feeling sunglasses! My top was released in the Mainstore of Just Because and the skirt is from the latest set of releases by Neve. I love when shoe fatpacks are hud based, so that you can change the colors of individual parts. That’s the case with these Columbine sandals from Glamistry. Also, how could I NOT own these, when columbines are the state flower of Colorado, the beautiful state I get to call home. I titled the above picture C’mon get strappy, which is a play on C’mon get happy… and a horrible pun that I did in honor of my brother Benton (I owed him one). But how fabulous is it that with the fatpack I could make the shoes multiple colors to match my skirt and top? The hair I wore in the full body pic is from Exile, and it’s a brand new release for Summerfest, which has just opened. I spent a small fortune at Summerfest, so I’m sure to have more blog posts featuring items from it before long. But definitely check it out… it’s an event I always look forward to each year. The final hours of The Epiphany! The Epiphany ends tomorrow (May 5th), so if you haven’t been yet, hurry! Remember, every store has out an exclusive item that you can get by redeeming points from your extras. Those won’t ever be available anywhere else again, so don’t miss out. I wanted to showcase the adorable hair that is a collaboration between Mina and Aphorism. And another color of Buzzeri’s gorgeous Glacier eye series, both of which you’ll find at The Epiphany. I had to shoot an ad for Pose Fair 2016 (yes, we work far ahead of schedule) and I couldn’t resist the opportunity to create a seductive setting using the gorgeous new bedroom set from Stockholm & Lima, which can be found at FaMESHed. It’s super romantic and dreamy. The pose is meant as a candid wedding pose, but would certainly work for any romantic scene. I wanted to create a romantic and dreamy honeymoon suite. I bought my alt the gorgeous Annabelle gown from Just Because. I blogged this a while back, but I only showed the front and I love the detail work on the back, which you can see here. I also wanted to shoot a close up to show off this gorgeous applier from Izzie’s for the LOGO mesh head. It’s called Tiggi and it’s a special ginger with freckles edition that I discovered while shopping there for something else entirely. But my favorite part is that it’s only L$225, which was just too great a price to pass it up! I also have on add ons from Izzie’s (eyeshadow and lipstick) which you can purchase separately. My beautiful earrings are by Cae and they are part of her Gacha Garden release. The earrings are part of the Sweetheart set that is her Seed Of Inspiration. You automatically collect these limited edition prizes by playing any machine 20 times. There’s also a necklace included that I plan to blog at a later date. They match her Loved ring, which is available in her Mainstore and which is just gorgeous. When I saw the gorgeous gown Maya Just Because released for FaMESHed, I thought it was red carpet worthy. Then I saw Izzie’s exclusive for The Epiphany, and I knew I was onto something! The jeweled pin on the gown is texture change, with multiple metal and pearl options, and all of the Izzie’s trophies are adorable (and include wearable and rezzable versions). I kind of dig that I have this bored look on my face in the first pic, which is why I titled it “Who are you wearing?” because female celebrities must get SO tired of that, lol. Also, I knew that the Rowne Paparazzi would come in handy at some point when I just *had* to have it from The Arcade last year. The Izzie’s prop includes rezzable versions, statues in silver and gold (silver is my preference, so that’s featured here) and the thought bubbles, which are optional but pretty darn cute. I’m also wearing new jewelry from Cae, which you can find at the Wayward Winter event, and my hair – along with the gorgeous, texture change clip – are by Truth, also for The Epiphany. It’s been a while since my last post. I had major video card problems, and on top of that my grandmother became critically ill rather unexpectedly the week before Thanksgiving. Sadly, just a few hours ago, she took her final breath. Those of you who follow me on Plurk know what a roller coaster this has all been for my family. I’m not going to say a whole lot here tonight, but I just really needed the distraction and release I get through blogging. Yesterday, I had the first strong desire to take photos I’ve had in a while, and it was all inspired by seeing this incredible gown Evie’s Closet released for We ❤ Role-Play. As beautiful as it is on high quality, to fully appreciate the beauty you need to enable materials on ultra quality. The detail you see once you do is just stunning. But even if your computer can’t handle materials, this gown is simply gorgeous. I’m wearing one of Glam Affair’s LOGO appliers, also available at We ❤ Role-Play. I really loved the fresh face of this applier, with the slight sprinkle of freckles and pink cheeks and nose, as if you've been out in the cold. I might've been inspired to do this shoot after seeing the incredibly gorgeous wedding photos of Richard Marx and Daisy Fuentes, though I didn’t even think of it until after I took the photos. I took these pics standing on Cheeky Pea’s Wedding Bridge, on one of the Blithe sims. They’re so beautiful, all done up for winter, and definitely worth checking out. When I saw N-Core’s release for Kustom 9, I knew I was in trouble. I love roller and ice skates and leg warmers. Then I realized you can turn off the blades or wheels and wear them as a boot, and I was doomed. I had to have the fatpack. It’s really an amazing deal. It’s just L$1999 for all fourteen color versions, and the hud lets you custom so much. Plus, you get skating animations and a basic skating AO, too! But I already had this outfit worked out, using Neve’s new mainstore release for The Mix, and I thought roller skates would be the perfect compliment! My thigh high socks are fri.day’s cozy socks for Collabor88! I am also wearing new Tableau Vivant hair from Kustom 9, as well as Lara Hurley’s recently released appliers for the LOGO Alex mesh head. And my adorable butterfly ring is from Cae’s Charmed 2 series, which is available at the current round of Cosmopolitan. And of course, I took these pics at Blithe. If you haven’t been yet, you should! 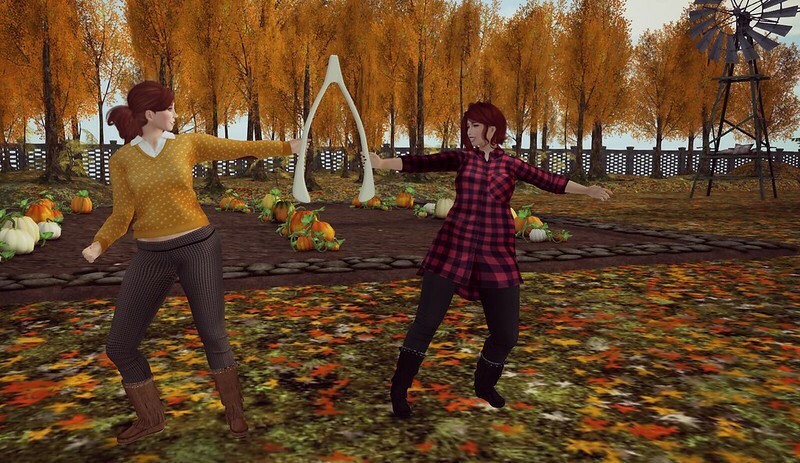 Blithe consists of two sims that are group only access, but the L$250 to join is well worth the cost, and helps keep Blithe alive for us all to enjoy. Rumor has it that Blithe will close for a few days in the next ten days or so to undergo a seasonal change, so don’t miss the opportunity to take gorgeous autumn pics there before winter arrives!